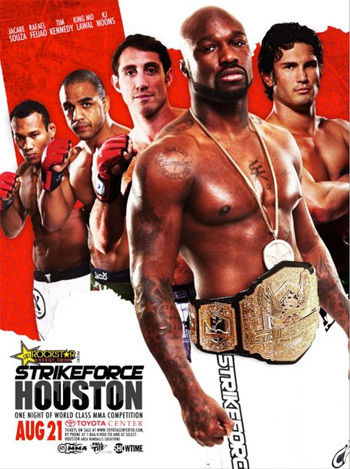 “Strikeforce: Houston” is officially underway inside the Toyota Center in The Lone Star State. 5thRound.com will be providing LIVE coverage from the jump, so make sure to stay with us for the latest in tonight’s fights. You can catch the main card on Showtime beginning at 10PM ET/PT. SPOILER ALERT: Only fans with access to an east coast feed will be able to watch tonight’s extravaganza live. So don’t continue reading if you don’t want to know the results ahead of time. You have been WARNED! Although the event didn’t receive as much hoopla as prior Strikeforce shows, the fight card quietly turned out to be quite solid. A pair of championship scraps will be featured in the Showtime broadcast, as middleweights Tim Kennedy and Ronaldo “Jacare” Souza will determine who will don the vacant belt former champ Jake Shields recently left for dead. The Gambling Gods predict Jacare will be leaving Texas with Strikeforce gold in tow. Fresh off his convincing win over Gegard Mousasi in April, Muhammad “King Mo” Lawal looks to make his first successful title defense against a very talented Rafael “Feijao” Cavalcante. His majesty is a 5-to-1 favorite to hand the dangerous Brazilian his third pro blemish and retain his strap. Here are the results for tonight’s show.